BLOG – Move Your Life Forward with a Reverse Mortgage Loan. Reverse mortgages have changed for the better. These mortgages, which allow people 62 and older to tap into their home equity in the form of a non-recourse loan, have new requirements and options making them safer and more sound for borrowers. In 2015, the Federal Housing Administration, which ensures Home Equity Conversion Mortgages (HECMs, or the most common type of reverse mortgage) implemented new requirements for all borrowers. In addition to required reverse mortgage counseling, all loan applicants must go through a financial assessment to help ensure they can meet their loan obligations. Historically, some borrowers have taken out their home equity as a lump sum payment, have spent the sum, and have been unable to adhere to those requirements. This has led to their defaulting on their loans. The new rules were put in place to make sure borrowers can still meet those requirements. If there is a question about whether they will be able to do so, they may be required to have a Life Expectancy Set Aside, or a “LESA.” Similar to the concept of an escrow account or a set aside to pay forward mortgage taxes and insurance, this LESA is calculated based on the borrower’s age and life expectancy and helps plan for these ongoing payments. It allows them to plan for future payments in advance, removing the possibility that they will exhaust their proceeds and end up unable to meet their obligations. 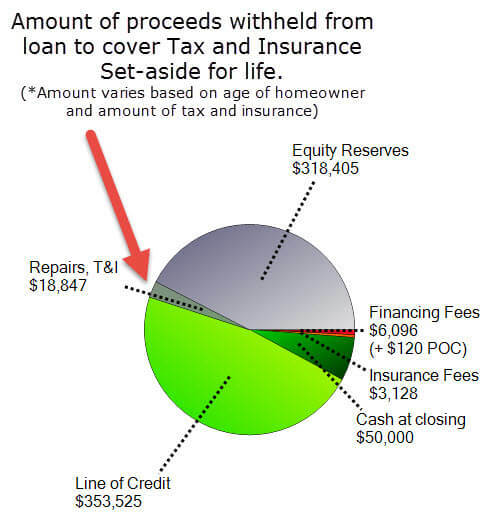 While some borrowers are required to have a LESA based on the financial assessment, others can simply choose to include one in their reverse mortgage plans. This can give peace of mind to new borrowers who may have reverse mortgage concerns. A LESA set-aside will mean the borrower receives less in proceeds, but it’s also a great option for a borrower who has any hesitation about meeting the loan requirements. In fact, some family members of reverse mortgage borrowers are requesting a Tax and Insurance set-aside to give their aging parents peace of mind. Betty was born in 1932, has a home valued at $750,000 and has no existing forward mortgage on her home. Betty wants to remain independent, but is worried about making her tax and insurance payments over the course of her loan. Her son recommended that she request a LESA to ease her worries. With a LESA of $18,847 Betty can still access the home equity she needs, and does not need to worry about ever missing a tax or insurance payment. By setting aside a small portion of her home equity in advance, she can achieve her financial goals without any additional worry.